We have three lovely self-catering options to suit your needs. The Little Farmhouse nestles in a tranquil forest setting on our farm just a few km from Stanford Village. Lagoon View is one of several homes in a private estate overlooking the Hermanus Lagoon and The Blue house is one of Stanford`s original cottages overlooking the Market Square in the middle of the village. See﻿ www.stanfordinf﻿o.co.za ﻿ for current events in our village. This spacious Victorian cottage is perfectly positioned in the Historic Core of Stanford. Comprising of 2 bedrooms with double beds and the 3rd bedroom with 2 sets of bunk beds makes it ideal for 2 families sharing. Stylish country chic with crisp white linen, big puffy couches and old Persians rugs. Understated country elegance. Just 3km from the village, The Little Farmhouse is perfect for either a romantic weekend away or a family holiday with the kiddies. Comfortable and homely, the cottage has a feeling of stepping back in time. A Dover stove has center stage should you feel like a slow cooking experience during the winter, but we also have an electric stove as a second option. Bring your bicycles, fishing rods and hiking boots. There is plenty to do in the immediate vicinity including a selection of excellent restaurants and wine farms. This luxurious self catering house is situated in an exclusive estate overlooking the Hermanus Lagoon. Uninterrupted views of the water from every window makes this quite a spectacular getaway. Spacious living areas lead out onto the large deck which for easy summer entertaining while watching the yachts sail by. And what a pleasure to be able to launch your boat from the private jetty for a ski. Pop over to Hermanus for a game of golf, a walk on the cliffs or to visit an art gallery. 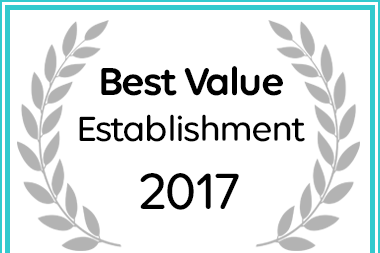 Overberg Gems in Hermanus has received a Best Value award.